Come with us on a journey as Township Rebellion touch down in Perth for a night of driving, melodic dance like no other. The duo from Koln have been stalwarts in our residents sets for some time now and we’re so proud that we have finally had the opportunity to bring them to Perth. With consistent signings on esteemed labels such as Stil vor Talent, Ger and Steyoyoke, rest assured of the quality these guys will bring to the dance floor. Join us on November 16th. 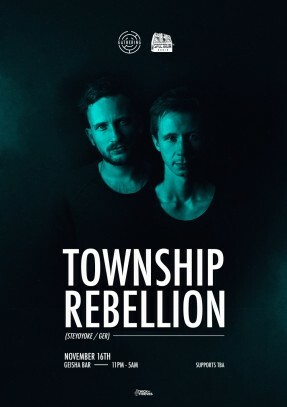 Township Rebellion have found a way to captivate, regardless of personal taste. In the studio, they are consistently at work creating vibrant, moody and driving tracks that have helped then find support from influential, underground DJ’s. When it comes to playing, Township Rebellion are regular faces in the international club and festival scene, often rocking crowds in the thousands with their perfectly crafted sets.